Since the late 19th century, Optometry has been taught at City. George Wigmore takes a look back at Optometry’s proud history at the University and considers the outstanding contribution of Professor Robert J Fletcher to its success. Our eyes, and the sight they afford us, are one of the most fundamental aspects of what makes us human. From the everyday world, to art and the environment, vision is vital. For over 100 years academics at City have been striving to find out more about our incredible optical system in health and disease, helping hundreds of thousands of people see again in the process. One of the oldest establishments to educate opticians in the world, the relationship between City and Optometry began in 1896 with the incorporation of optometry teaching from Finsbury Technical College, which had started offering it 10 years earlier. Optometry at the Northampton Institute developed further in 1898 when the Worshipful Company of Spectacle Makers offered to pay the salary of an instructor in visual optics, but it was several years later in 1903 with the foundation of the Technical Optics department that the Northampton Institute (itself founded nine years earlier) developed a significant presence in the area. Initially founded with the objective of promoting ‘the industrial skill, general knowledge, health and well-being of young men and women belonging to the poorer classes’, the addition of optics to the original suite of courses made sense considering the Institute’s proximity to many of the optical businesses in the City and provided an important service to Clerkenwell and the City of London with its offer of a strong technical education. A core component of research and education from the outset, its creation heralded the real start of City’s important contribution to the study of optometry, with 75 students enrolling for the first opticians’ evening class in 1903, including the first course in sight testing. Full-time classes then started the next year, with around 200 students across all three years taught in the early days. In 1927, the Institute built on this foundation with the establishment of the Department of Optometry and Visual Sciences, subsequently becoming one of the first establishments in the world to educate optometrists – something which remains to this day as City is still the only institution in London to offer a BSc in Optometry. 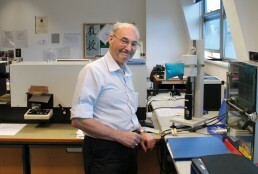 Henri Obstfeld, a City staff member and alumnus, who worked for many years at the University’s Optical Appliance Testing Service testing high street glasses and sunglasses until his retirement last year, also remembers the University from a different time. “When City University was inaugurated during a convention at the Royal Festival Hall, I had the privilege of being present,” he says. “It wasn’t too far away from what I do now as it involved spectacle frames, lenses and the equipment that comes with them. It was what I taught, so I knew about a lot of this stuff,” he says. 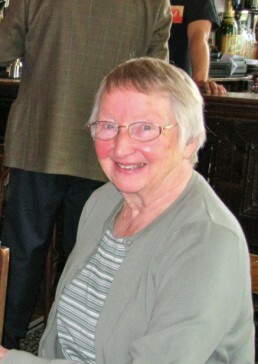 Ann Wieland, who studied here from 1947 to 1949 and met her future husband on the course, still periodically meets other classmates at The Peasant pub on St John Street to reminisce and catch up with her old friends. “We still manage a reunion every year and are in the process of organising this year’s meeting in the summer,” she says. Having developed steadily since the foundation of the Department of Optometry and Visual Sciences, a significant appointment was made later on in the 1960s that was to shape the Department for many years to come. In 1966 Professor Robert J Fletcher was appointed as the first Professor of Optometry outside the United States. Originally joining City as a student in 1941, Professor Fletcher was following in the footsteps of his father who had studied Optometry here in the 1920s. 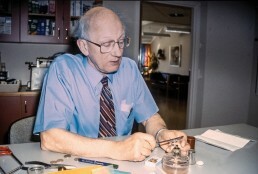 Having continued his studies in Manchester, he returned in 1950 as a lecturer, subsequently leading the Department of Optometry and Visual Science for two decades until his retirement in the 1980s. During this period he developed a new three-year BSc degree in Optometry followed by MSc and PhD programmes and contact lens courses. Over 10,000 students have benefited from his teaching in over twenty countries and many more from other disciplines through his 150 publications and 16 textbooks. His research interests have been diverse and he is the designer of several optometric instruments, many of which are still used today. As a result, Professor Fletcher stands as an important figure in the field – and in the history of optometry at City – with his outstanding and unique contribution to optometric education in the UK and around the world throughout a career lasting seven decades. It is safe to say that no other person in Europe has had such influence and it is these achievements that were celebrated this summer at a symposium marking his 90th birthday. Professor Robert J Fletcher’s achievements were celebrated summer 2015 with a symposium at City marking his 90th birthday. Another figure who has gone on to play a prominent role in the optometry world is Robert Roope, a 1962 alumnus, who, inspired by his love of eyewear in the jazz era and dissatisfaction at the badly made and poorly designed spectacles on the high street, created Black Eyewear. Since the creation of the company, Robert’s designs have become extremely popular and are worn by celebrities ranging from Lady Gaga to Will I Am. More recently, the development of optometry at City continues, as after 15 years at Bath Street the Fight for Sight optometry clinics are moving to a new home on Northampton Square in the Tait Building. The new clinics are due to be handed over to the University mid-August and will open to the public around the beginning of October. The move is very exciting for the Department, not just because the facilities will all be on one floor, but for the first time the clinics will be on the main University site providing ready access to eye care for staff, students, alumni and local residents. Offering thousands of free eye examinations and contact lens fittings every year, the clinics will continue to offer a valued service to the community and also training to our students. One of these students is Dhruvin Patel. Graduating this summer from the BSc Optometry course first established by Professor Fletcher, Patel has during his time at City developed an innovative product called OcuShield. Winning the CitySpark competition for student innovation in 2014, OcuShield is a blue light screen that protects your eyes and aids sleep by cutting out the blue light transmittance from electronic devices, as such frequencies are known to cause eye strain, fatigue and increase the likelihood of eye diseases. Launched in January, OcuShield is stocked in over a dozen opticians and sells on one of the largest UK independent eye care e-commerce websites and Amazon. 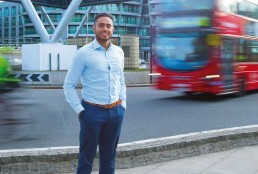 This summer sees Patel working full-time on the business as he aims to extend his product range and he will begin his pre-registration as an optometrist in August. As a result, with Patel and other young optometrists coming through, City is in great hands as it continues to deliver the best possible research and eye care to people in the UK and around the world, building on the legacy of Professor Fletcher and those innovative optometrists who paved the way at City University London and the Northampton Institute before it. 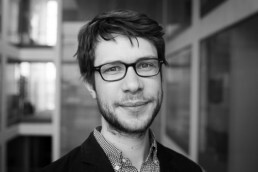 George Wigmore is the Senior Communications Officer for City’s School of Health Sciences. He has also written for The Guardian and The Observer.